London 2012: A Plastic Bag Free Games? Lindsey London 2012: A Plastic Bag Free Games? When Modbury in Devon dumped plastic bags in 2007 we all sat up and watched. All 43 shopkeepers agreed not to use them and locals changed to cotton and jute bags, relinquishing stocks of old plastic bags to an amnesty which saw them recycled into furniture. Communities all over the UK used Modbury as a model and tried to follow suit. Then in January 2010 Boris Johnson announced his ambition that London should be plastic bag free in time for the 2012 Olympics. But what progress has been made? According to their website Modbury is still plastic bag free. But a quick Google search reveals that many other towns' campaign websites have lapsed - Brighton, Stirling, Godalming are a few. Even the website set up in Modbury's wake, designed to help other areas: www.plasticbagfree.com is no longer active. Communities that worked hard to eliminate plastic bags a couple of years ago seem to have lost momentum. Bucking the trend is Penrith with an active campaign for 2011. Kudos Penrith! Londoners were surveyed back in 2007 as to whether they would support action on plastic bags. 90% of respondents supported some sort of action (a levy, for example) and 60% were in favour of a ban. Despite the support, London Councils wimped out on legislative action. 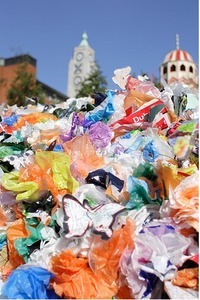 Recently, we stumbled across a petition to put pressure on London 2012 to commit to a plastic bag free Olympics. It was put up in late 2010 by Greener Upon Thames - a campaigning group in the boroughs of Kingston and Richmond - but has been gradually gathering new signatures ever since. Remember, we were told to expect the greenest Olympics ever yet we've already seen targets for renewable energy adjusted down. Banning plastic bags from all Olympic sites, venues, merchandise stores and caterers would surely be an easy win for sustainability and could spark a renewal of interest in the plastic bag free campaign across the city and country. Heck, imagine if plastic bag free Britain was a genuine legacy of the 2012 games! With just a year to go we've emailed the Mayor's office about the apparently forgotten pledge on plastic bag free London and are urging them to at least support a plastic bag free Olympics. In the meantime, you can sign the petition to put pressure on LOCOG and help reignite passion for this cause. Unclear about the issues? Greener Upon Thames have produced a really handy FAQ about plastic bags.